Kat Galvis Rodriguez ’17 and George Abraham ’17 (below) provide a preview of the performances they created for a national competition in Boulder, Colo. Photos by Martin Froger-Silva ’16. 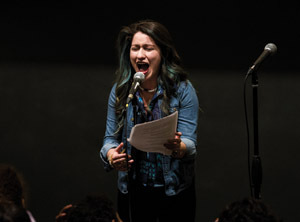 While countless generations of Swarthmore students have spoken these words during rounds of misery poker in the midst of midterms and finals periods, Kat Galvis Rodriguez ’17 was describing something beyond the realm of academia: slam poetry. Our Art Spoken in Soul (OASiS) began as a student group several years ago to develop and share slam poetry, a spoken-word art form in which artists recite original poetry, either individually or in groups of up to four people, dealing with a wide range of topics. Weekly meetings, which typically attract between five and 15 members, are times for students to write about anything they want, share with the group, and join in creative writing games to get creativity and words flowing. 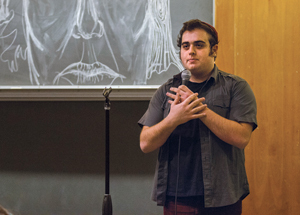 Members of the group, some of whom compete against other slam poetry teams around the nation, are quick to point out that “reciting poetry” does not begin to adequately describe what they do. The topics that team members write about are almost always deeply personal. From family life to relationships to larger societal problems, nothing is off-limits. Given that such honest, emotional thoughts only arise in certain situations, students have come up with original ways to keep track of their ideas. 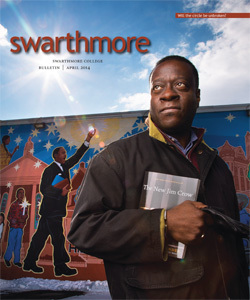 While the group delights Swarthmore audiences, it also has enjoyed success at the national level. Last year, OASiS placed in the top 10 out of 59 teams at the College Unions Poetry Slam Invitational (CUPSI) in New York. Competition aside, bonding with spoken-word artists from around the nation is a benefit of the gathering of poets. This spring, the team of five—Rodriguez, Vieytez, Wunrow, George Abraham ’17, and Haydil Henriquez ’14—was gearing up for CUPSI in Boulder, Colo., March 12–15. (The team placed 26th out of 52.) While they have been successful competitively, the real benefits of slam poetry are more intangible.